Last week, Foodista shared some delicious slow cooker chicken recipes and now we are back with five more! These recipes show how versatile chicken can be, it can take on almost any flavor profile and be tasty. Since it's comfort food season, we've included a variety of soups, chili and other favorite chicken dishes. Chicken enchilada soup only requires 10 minutes of prep time and then it's smooth sailing from there. Aside from searing the chicken breasts and thighs, the rest of the cooking is done in the crock pot. This meal is lighter than traditional enchiladas and naturally gluten-free. When making chicken pot pie from scratch isn't an option, this slow cooker version has all the flavors of the classic without all the work. I like to serve mine with a split biscuit and pour the soup over the top. You can make a double batch of this soup and freeze it for up to 3 months. Five ingredient Mexican spiced chicken is made in the slow cooker without much effort on your part. Chicken breasts are combined with your favorite jarred salsa, taco seasoning, and Mexican beer before cooking low and slow for at least four hours. You can also use boneless, skinless chicken thighs too. Enjoy chili lime shredded chicken in tacos, burritos, salads, nachos and much more. The best chili is cooked on a low flame for several hours so that all the flavors can develop and meld together into one supreme pot of deliciousness - that's why the slow cooker is perfect for this dish. Cubed chicken breasts or ground chicken are browned on the stovetop and then added to the slow cooker. The rest of the ingredients are thrown in, mixed together, and left to cook for at least four hours. If you are looking for a recipe to shake up your regular rotation, this hot and spicy Korean chicken is perfect. Better yet, this recipe only requires 4 ingredients. Boneless, skinless chicken breasts are cooked in a jarred Korean barbecue sauce for several hours. You can purchase the barbecue sauce at your local Asian market or online. 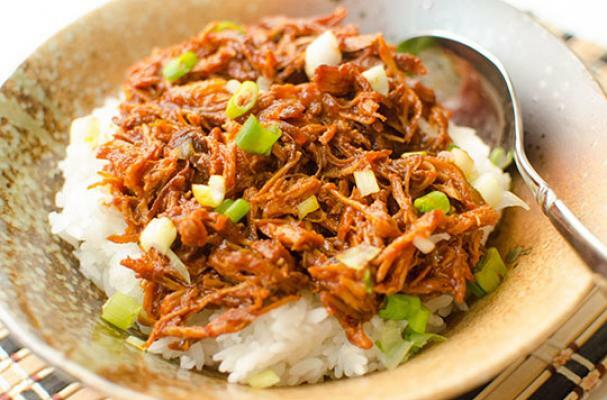 This dish is traditionally served over rice with thinly sliced green onions for garnish.